We started watching the new zombie series on AMC called “The Walking Dead” I actually found out about it from reading the following post over at TEOTWAWKI website: http://teotwawkiblog.blogspot.com/2010/11/review-walking-dead-premiere.htmlPlease know that the series is very intense, with much blood and gore, especially the 2nd episode. We had the kids play in another room as the show is not appropriate for children. Now that I have covered that disclaimer, I have to admit, I actually like the show. We had recorded the first and second episode and since our relatives missed the show, we invited them over to watch with us. After watching the two episodes, we got to talking about what would we do if something like that happened to us, hypothetically, of course. Everyone agreed the first thing to do would be to leave the city. But then the discussion progressed to what would we do if some other disaster, a more real one, such as pandemic, really did happen. Questions came up regarding what would we do as a family. This topic then led to a discussion about being prepared for anything. To be honest, we had never told our relatives about our prepping efforts because we did not know how they would feel about it. Turns out, they were just as concerned about the times we live in and have already taken some steps to be more prepared. They had not brought it up before either; they did not want us to think they were wacky. They even have a suitcase packed with seasonal clothes for each member of the family that they keep in the trunk of their minivan. While not a true bug out bag, it’s a good start. Before you know it we were having a lively discussion about long term food storage and where to buy mylar bags and other supplies. I feel relieved the “big secret” is out, as this family lives closest to us of all our relatives and I was worried how they would fare in an emergency. It was purely unintentional, but watching “The Walking Dead” was a great way to get a conversation started on a very important, but possibly touchy subject. I have not seen this series yet, but the consensus that you came to seems to be the same of those I hear talking about it. Everyone that I have spoken to is speaking about the possible pandemic situation or replacing the zombies with hoards of refugee/locust types. The benefit of this show, novels like Day by Day Armageddon, or games in a similar vein is it allows people to safely discuss and consider issues they ordinarily would not want to confront. If I talked to folks at work or friends about “prepping” they’d think I am nuts. However discussing it in terms of “the walking dead” and “what would you do?” makes it safe. Its a funny thing to confront reality through fiction, but hey whatever it takes to wake people up! I read the books (graphic novels, really) and saw the first episode. I’m impressed with how well the first episode came out, the books are favs of mine. I’ve got 2 words for you: roof tops. The suckers couldn’t climb. Get on top of your local Costco and you’re golden. ;->. We had a similar “moment” amongst a group of friends when a copy of “One Second After” made the rounds. There was some discussion on being a bit more prepared, but soon after, everyone (except me) went back to their normal routine. It was disappointing, and we are still solo. Thanks for not putting any spoilers for the show in your post. We do not have cable and only get to watch the show a day after everyone else! So far, we really enjoy it. Hey Mark, thanks for stopping by. I wasn’t sure the relatives would be serious about it either, until a few days later we got a phone call from them asking if we wanted some food grade 5 gallon buckets they were getting for free. Wish we’d known they’d have a source, we already bought ours! I’m going to look this up on my local provider’s listing. This weekend, I had some friends over, and at one person’s suggestions, we watched “Zombieland.” It was a comedy, but what made me smile at times were the characters’ repeated uses of firearms (shotguns) to fend off zombies. I did not bring up the subject of prepping with the group because I am convinced they’d find it crazy – two of those who were there yesterday saw my kitchen at a similar meeting weeks ago. They saw my kitchen shelf, which had at least 8 cases of canned soup (each case holds 4 large cans) and both laughed, joking about how my kitchen reminded them of a fallout shelter. I smiled, but the joke was on them as they had no idea that they were actually on to something. The only person yesterday with whom I might ever remotely discuss this is somebody who is a former member of the military. He and I briefly discussed the weapons shown in the film and later during dinner we discussed survival tactics. He said that only spec ops troops were allowed to enroll in a special survival course offered by the military. He had wanted to take it. I’d love to take such a course too even if I had to quit in the middle if it proved to be too difficult. The usefulness of skills one would learn in such a course would be of immeasurable value. I’ll see if I can catch this show and I do I’ll come back to this blurb. While there may be a natural transition from zombie/disaster type discussion to real life prepping, it does may not always work out. We definitely were not the first to bring up the subject. I would consider training in a survival course, but not sure how my endurance would hold up! Thanks to all who commented on the post. I appreciate finding out what what everyone thinks! Thanks for the tip about this show, I will look for it on DirecTV and have a look. I find it interesting that it seems in general that there have been a fair amount of survival type shows these days compared to a number of years ago. Since money talks, it tells us that people are watching these types of shows, which also tells us that perhaps more of the people around us are concerned about the general issue (I hope so). Apartment Prepper, I know this entry is over 1 year old, in your old WordPress blog… but I only recently began to watch this show. By mere chance I stumbled into AMC this past Sunday night and caught 2 episodes, including the mid-season finale. 1. Human dynamics within a group of survivors will be a significant factor. Personality differences, varying goals, as well as the presence of children and older people, those with skills vs. those who have no skills (Rick, Shane, Daryl vs. the rest). 2. Localized “know-how” can be quite useful. Glenn can’t fight and it’s probably not accidental that only later on in the show does he ever brandish a firearm – but his intimate familiarity with Atlanta’s streets proved crucial. 3. The instinct for survival WILL take over. 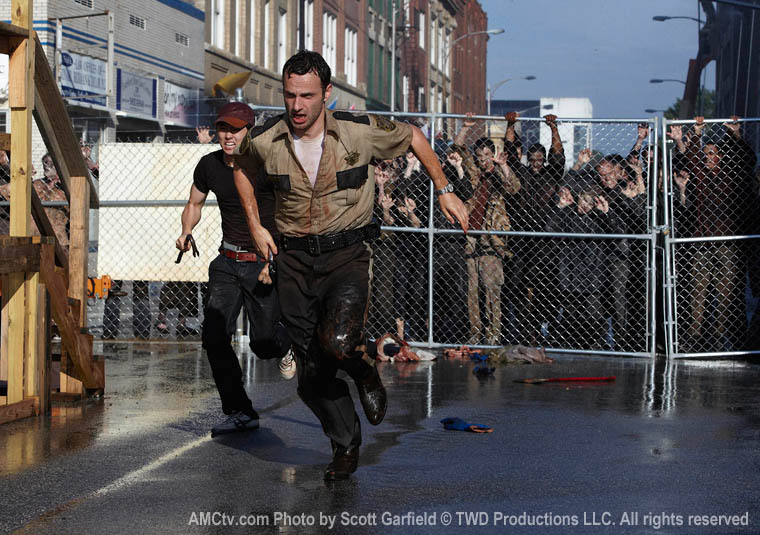 Shane’s shooting of Otis to save himself, thus leaving Otis to die at the hands of the walkers, proved that a post-apocalyptic scenario will bring out the absolute worst in already selfish and self-centered human beings. 4. Even in times of tragedy, human beings will still be capable of kind acts – I for one find it difficult that Hershel was willing to take in so many people, thus accelerating the consumption of his supplies. Granted, he lives in a farm and not in a bunker, so technically he can grow food. 5. Rednecks (Daryl) will probably fare quite well given they know how to hunt and to fish, and so will survivalists. Those in urban settings who rely on microwaves and take-out, not so much. I am glad you got a chance to watch the show. It does bring up a lot of good points. I thought the Shane shooting of Otis was the most intense episode and felt bad for a day after I watched it. A large scale disaster such will bring out the worst in people; but it will bring out the best as well. Comments are appreciated but will be subject to approval prior to posting. Please be kind and courteous. © The Apartment Prepper's Blog, 2010], Unauthorized use and/or duplication of this material without express and written permission from this blog’s author and/or owner is strictly prohibited. Excerpts and links may be used, provided that full and clear credit is given to The Apartment Prepper's Blog with appropriate and specific direction to the original content.